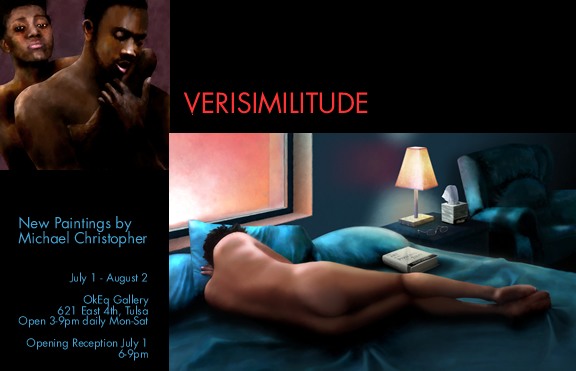 Verisimilitude: New Paintings by Michael Christopher opens July 1, 2010 with a public reception from 6 to 9 PM at the OkEq Gallery, 621 East 4th Street, corner of 4th and Kenosha, downtown Tulsa, and runs through August 2, 2010. All works are for sale. A portion of proceeds benefits Oklahomans for Equality, and a portion benefits The Small Boats, a science fiction human rights film project. This is not photoshop. It is also not photography. But it is made in the computer. It is made by hand, brush stroke by brush stroke. Using cheap drawing and painting software, and writing some of it myself, I make “painterly” photo-realistic figurative paintings. Some of them are virtually indistinguishable from oils on canvas. Some are almost indistinguishable from photography. It is no faster than painting in oil on physical canvas, and it is no easier (although 40 layers of Undo help). It requires no less skill and is no less expensive in terms of materials. I used to paint with oil on canvas. So why do I do it this way now, ending up with what is essentially a "print" rather than what we are comfortable calling an "original?" You have recently watched a movie, or at least a television spot, that is virtually indistinguishable from reality but was made wholly in the computer, without a camera to capture anything that was ever physical matter. You adapted your sense of reality. Your Theory of Mind shifted ever so slightly, allowing that someone else could guess well enough what the world looks like to you that it was possible to manufacture one for you. Hundreds more are in production, and we will all adapt again, spreading and weakening the boundaries around the solipsistic notion that our personal reality is a private one. The human position within the reality that is made in the mind has been shifting, has been blurring at the edges, since the first cave painting. They are light years apart: smelly reality, painting, and imagery that is born of bits rather than atoms. But when we place the soothing and familiar paradigm of artist's oils between CGI and the subject "matter," you may find yourself in a shimmering, refracting space between them. Like an optical illusion, you may from time to time forget what you are supposed to be seeing. Looking at these works you might shift back and forth between the sheer layers of abstraction, and begin questioning what should be meant by "original" and "painting." Tulsa, OK -- Michael Christopher began figurative painting as a young teen, dropped it by the time he turned twenty, and started again thirty years later. In between, Michael found other creative pursuits, beginning to work as a professional actor at twenty, later doing theatrical production design, then composing incidental music for the theatre, and later writing scores for musicals and an opera. He has performed as an actor, singer and musician with touring theatre companies, the Tulsa Philharmonic, Tulsa Opera, Light Opera Oklahoma, as well as various local and regional theatre companies. In the late 80's Michael helped organize Tulsa Artists Coalition, and he founded the Tulsa Center for Contemporary Art (TuCCA). He has been published in the poetry journal Nimrod, and has composed commissioned musical works for the New York State Museum, the school district of Albany, NY, eba Dance Theatre, Tulsa Philharmonic Woodwind Ensemble, CityArts (Tulsa), The University of Tulsa and other organizations. What started a few years ago as a handful of illustrations for a graphic novel project became a more serious return to painting. Picking up where he left off in about 1973, the works in this show reflect an eye for photorealistic rendering and a vision that loves and understands the human form. In 1987, Living Arts of Tulsa presented a one-man show of Michael's visual art of that particular time: three-dimensional, electronic, robotic, and political. The works in Verisimilitude spread open the timeframe, drawing on the idealized realism of the early oil paintings, touching on themes from that 1987 show, Boys in the Machine, with a poetry acquired from a life as an artist working across many disciplines. The paintings in Verisimilitude raise interesting questions about artistic values. Some viewers have expressed a feeling of disappointment when learning that the works, which seem so realistically to be painted with a physical brush, were really made in the computer, as if the digital medium is somehow beneath fine art. The works are not from photographs, but are made using drawing software similar to programs used in architecture and engineering. After a computer drawing is made, it is "painted" using brushes, smudge sticks and other tools, each tool a small computer script written by the artist. These digital paintings take at least as long to create as "wet paint" works, but what does one mean by "original," when the digital file could be printed again and again, if the artist had not simply promised not to? This new dimension within realism, not mention the economics of the the fine arts, is one of the fascinations that drove the creation of these paintings. Michael brings a unique perspective, having been at the leading edge of synthesizer music, building his first modular synth in 1969, and developing realistically "orchestrated" scores for theatre and film capable at the time of fooling many listeners. "If an artist can do his art fairly well, he might want to consider taking risks that can advance change. Art is hard work, and I certainly don't do it for the money. When I show this work at outdoor art festivals, families walk by and see the work in context with other art. I think they can't help but notice that it belongs, even if they aren't personally ready for the expression. They will have seen this work, and then later if their lives or the lives of others in their families take a turn into a place for which they might otherwise have no social template, they will have the imprint of these images, whispering to them that everything's OK, it's alright, we've seen this before." A portion of the sales from this show benefit Oklahomans for Equality, and a portion will fund the next stages in the artist's film project, an animated science fiction film entitled The Small Boats. The film is a poetic chronicle of the queer diaspora. Follow the progress of the project, and experience Michael's art and music, at www.michaelfire.com.